…as we were a few weeks ago: it’s now March, which means it’s Women’s History Month. As part of my contribution to WHM I’ve decided to share this photo with you all. It’s one that I’ve had sitting in a box for years, since shortly after I came across it in a second hand bookshop/old print shop – you know, one of those places that sells old maps, books, and old illustrations that have been removed from books (not a practice I approve of at all I hasten to add). The reason I bought this picture is that at the time I found it we were living in Wolverton, and three of my children were actually attending the school, which by that point was no longer divided into separate infants/girls’ and boys’ schools, and which was by then (as it still is) known as Wyvern School. For those that don’t know, Wolverton is an old railway town, in fact it was apparently “the first town in Great Britain built by a railway company to house its workers.” I would imagine then that most of the girls in that photo are the daughters of coach builders and painters, the men who worked at the old railway works, where up until quite recently the Royal Train Shed (which has now been developed into luxury homes) was housed. The school celebrated its centenary in 1996. We were still living there at the time, and my daughters did the whole dressing up in Victorian costumes and playing with hoops thing, while this photo was used as part of the school’s centenary display. Anyway, I decided quite a while ago that I wanted to write something about this picture, mainly because it’s long been a favourite of mine, but also because I’ve always been struck by the serendipitous way I stumbled upon it; in a shop miles away from Milton Keynes, and during the time that my daughters were at the school. And then during my research I came across an interview that was done as part of a Living Archive project a few year’s prior to the centenary, with a woman who was a pupil at the school only a few years after the photo was taken. “There was a rocking horse in the classroom with two baskets on either side, so three children could have a ride at the same time. They had tables not desks and wherever you went, you took your chair with you. There were only 4 weeks summer holiday and exams were taken every year in “sums and composition”. The children played in the playground until 9.00 AM and only those with a sick note could go into the school before that time. Every day there was a school assembly in the hall and Miss Ainge opened each day with The Lords Prayer and a prayer of her own. A hymn was also sung. Roman Catholics were not obliged to go. They waited quietly in their classrooms and often read their scriptures. Scripture lessons were held every day for half an hour and “we learnt our hymn books and our Bible”. Ethel explained that all the young children had a small frame filled with sand in which they wrote. They did not have paper or slates to write on at that stage. The children “wrote” the letters of the alphabet in the sand and progressed from there to whole words such as “cat”, “rat” and “mouse”. Eventually, the children used paper and pencil and finally “you were given an ink pen. Each desk had a little ink well and a lift up lid and you kept your books in there”. Beautifully evoked Cath, thanks for doing this!!! Yup, just love women’s history, including local history in general. Yes it is an amazing photo – quite possibly the earliest surviving photo from the school. The Boys School on Church Street was built a decade earlier. 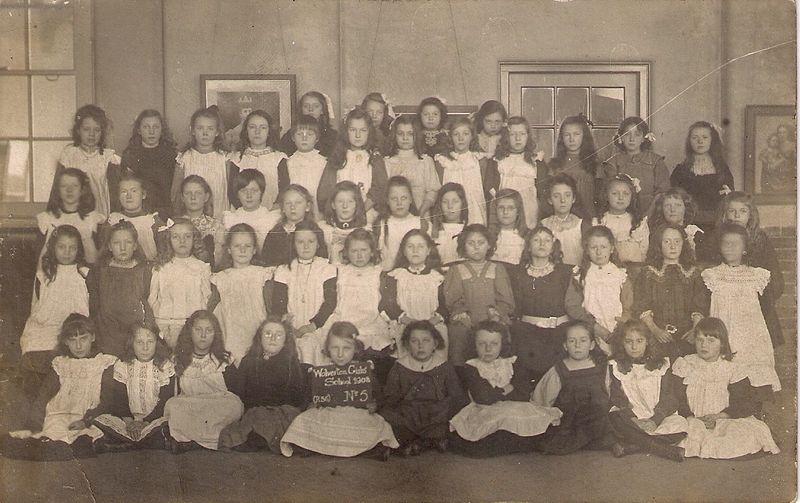 Girls and Infants continued to use the Creed Street school until this new school was built on Aylesbury Street. I think after 1945 the schools became co-ed – the Church Street school became an Infants School and at Aylesbury St. the Secondary Modern used the lower floor and the Junior School the upper floor. Lovely post, thank you. Real history. The really frightening thing is that sounds quite progressive…..
Lovely post and a brilliant picture. I come from Wolverton and have never seen that picture before. Thankyou.